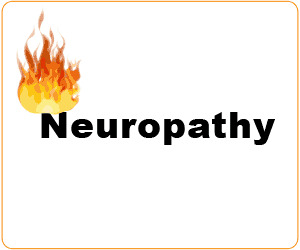 Injury to the cell body usually kills the neuron, and because mature neurons do not divide, it is not replaced. However, a damaged peripheral axon may regenerate. For example, if injury or disease separates an axon in a peripheral nerve from its cell body, the distal portion of the axon and its myelin sheath deteriorate within a few weeks. Macrophages remove the fragments of myelin and other cellular debris. The proximal end of the injured axon develops sprouts shortly after the injury. Influenced by nerve growth factors that nearby glia secrete, one of these sprouts may grow into a tube formed by remaining basement membrane and connective tissue. 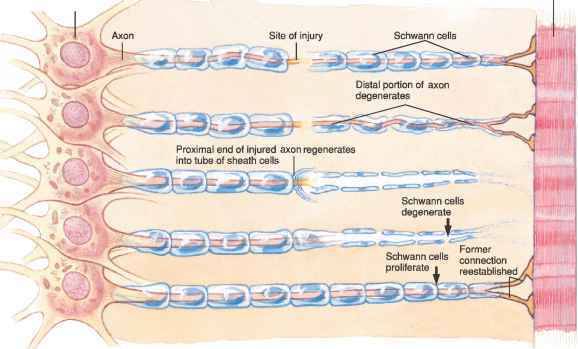 At the same time, any remaining Schwann cells proliferate along the length of the degenerating portion and form new myelin around the growing axon. If a myelinated axon is injured, the following events may occur over several weeks to months: (a) The proximal portion of the axon may survive, but (b) the portion distal to the injury degenerates. (c and d) In time, the proximal portion may develop extensions that grow into the tube of basement membrane and connective tissue cells that the axon previously occupied and (e) possibly reestablish the former connection. Nerve growth factors that neuroglial cells secrete assist in the regeneration process. Myelin begins to form on axons during the fourteenth week of prenatal development. By the time of birth, many axons are not completely myelinated. All myeli-nated axons have begun to develop sheaths by the time a child starts to walk, and myelination continues into adolescence. Excess myelin seriously impairs nervous system functioning. In Tay-Sachs disease, an inherited defect in a lysosomal enzyme causes myelin to accumulate, burying neurons in fat. The affected child begins to show symptoms by six months of age, gradually losing sight, hearing, and muscle function until death occurs by age four. Thanks to genetic screening among people of eastern European descent who are most likely to carry this gene, fewer than ten children are born in the United States with this condition each year. Growth of a regenerating axon is slow (3 to 4 millimeters per day), but eventually the new axon may reestablish the former connection (fig. 10.10). Nerve growth factors, secreted by glial cells, may help direct the growing axon. However, the regenerating axon may still end up in the wrong place, so full function often does not return. If an axon of a neuron within the central nervous system is separated from its cell body, the distal portion of the axon will degenerate, but more slowly than a separated axon in the peripheral nervous system. However, axons within the central nervous system lack a neurilemma, and the myelin-producing oligodendrocytes fail to proliferate following an injury. Consequently, if the proximal end of a damaged axon begins to grow, there is no tube of sheath cells to guide it. Therefore, regeneration is unlikely. If a peripheral nerve is severed, it is very important that the two cut ends be connected as soon as possible so that the regenerating sprouts of the axons can more easily reach the tubes formed by the basement membranes and connective tissues on the distal side of the gap. When the gap exceeds 3 millimeters, the regenerating axons may form a tangled mass called a neuroma. It is composed of sensory axons and is painfully sensitive to pressure. 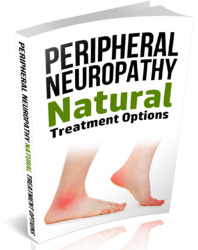 Neuromas sometimes complicate a patient's recovery following limb amputation. What is a neuroglial cell? Name and describe four types of neuroglial cells. What are some functions of neuroglia? Explain how an injured peripheral axon might regenerate. Explain why functionally significant regeneration is unlikely in the central nervous system. Why is functionally significant regeneration unlikely in the cns? Why functionally significant regeneration is unlikely in the central nervous system? Why might an injured persons peripheral axon regenerate? Why there is no regenaration of the axon in cns?